The Italian design and the charm of performing under limits are the key aspects of the Benelli TNT 300. It is housed with a 300cc machine which can beat the personality of any ruling contender of the series. Blessed with the network of DSK, the Benelli TNT 300 can ask for a favorable audience to look over the positive stance of this bike. As far as the looks are concerned the underbelly exhaust, street fighter appeal, and single side mounted rear suspension are the distinguishing facets of the same. It is an entry-level street bike that will offer excellent handling and riding quality, thus it rides on wide tyres and standard suspensions. Moreover, it is built on a steel trestle frame, that offers a dynamic ride quality. The narrow handle bar will give smooth handling in city traffic, while a single unit seat gives a comfortable sitting position for the rider and pillion. The bike will never disappoint you in terms of maintenance. The regular service interval gives it more durability for delivering power outputs. Furthermore, the spare parts of this machine are cheaper than its other models and will easily available at the service center. 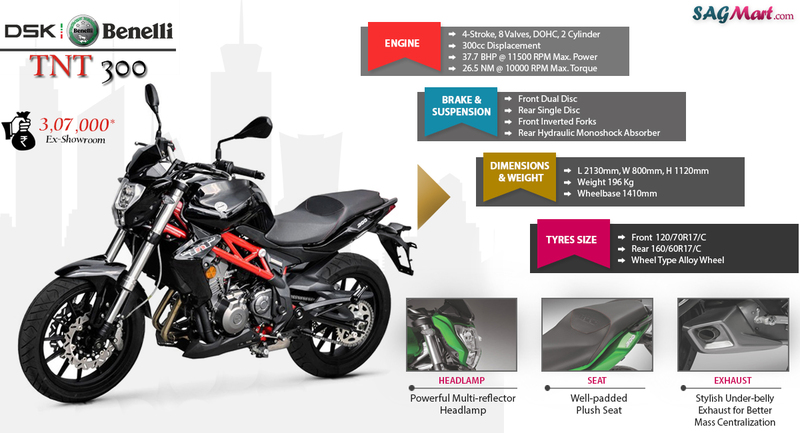 The Benelli TNT 300 is an entry-level bike that can be used for the track and city ride. It will surely grab much attention by its performance and naked profile. It will be available in two stunning color Orange and white.